If you love smoked salmon fish as much as I do,then you would love to know exactly how it is smoked.There are many different styles of smoking salmon.Depending on your preference ,you can choose whichever you want to use.However,I believe it would be better if you adopt the style that renders delicious Salmon,right?Let us go ahead and find out what exactly do you need to make the best smoked Salmon. Salt-Kindly do not use regular table salt.It will not give your salmon the flavor it deserves.I recommend you find kosher salt instead. Birch syrup-Salmon needs something that is so sweet as honey to supplement it.I think birch or maple syrup can add sweet flavor to you smoked salmon. Wood-Following your preference you can choose cherry wood,apple wood,oak or maple wood.They all work fine but I would recommend Brinkmann wood because it goes hand in hand with Traeger smoker. Traeger smoker-There a lot of smokers out there.However Traeger Timbers smoker is a nice and most favorable smoker because it smokes at a low temperature of 175F.Besides,It can tell you the temperature within the smoking chamber. A big plastic container-Also make sure you get a large and flat container so that you can use it with brine. A wire rack-This is exactly what you will use to dry your brined salmon.This is because it allows optimum air circulation hence speeding up the drying process. Once you are ready to go,make sure your Salmon is cut into smaller pieces of about 1/4 to 1/2 pound each.It does not matter what kind of salmon,whether king salmon,coho,sockeye,pink salmon,dolly verden,steel head or lohantam stout.This recipe suites them all. – 1 quart cool water. – 1/3 cup brown sugar. – 1/3 cup of crystal kosher salt. – 5 pounds of salmon. First cure the salmon-To do this ,prepare the brine by mixing brine ingredients in a clean non-reactive plastic or glass container,cover and place it inside a refrigerator.This is to make sure that the salt is infused to the fish while moisture is completely removed.The whole process will take you up to 4 hours.Other species of salmon such as pink,silver and sockeye salmon need up to eight hours to undergo the same process.All the same ,never exceed 48 hours however big the fish might be.These would make your fish too salty. Dry the salmon fish-Remove the fish out of the brine and take it to a cool place for it to dry.You can as well resort to use a fan to hurry up the process.The temperature at that particular place should not be more than 60F.Leave the salmon to dry for 2 to 4 hours until it forms a shiny skin known as pellicle. Smoke your salmon-Now it is time to smoke your salmon.Put the salmon in the smoker and begin smoking it at a lower temperature as you progress upwards.Even though this is hot smoking,high temperatures are not recommended.Just control your smoker temperature from as low as 120F and slowly adjust upwards to 175F.The maximum time it will take to smoke is 4hours. Baste the salmon-You said you want a sweet salmon,right?It is now time to baste it with maple or birch syrup.Remember,this is done just after every hour, while fish smoking is underway. Finally,cool and store in a dry place-Once the salmon is ready,you can lay it in a cooling rack for an hour before you place it in a fridge.After it has cooled enough in the refrigerator ,you can wrap it in a plastic or vacuum-seal it for further storage if needed,otherwise you can consume. 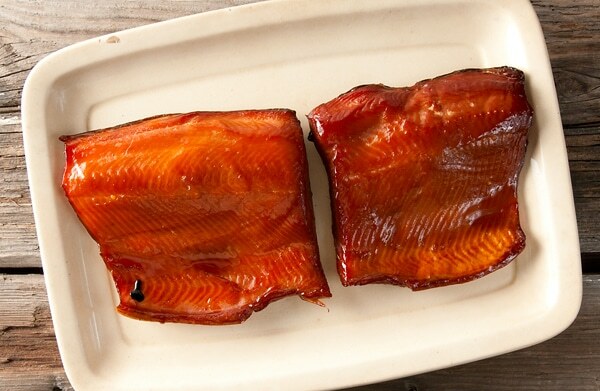 Now you have an idea of how to smoke your salmon fish.Just a piece of advice, take care of high temperatures because it will ruin things.However,this is a nice recipe for you.You can choose to apply it with various kinds of salmon fish and it will give you an amazing and delicious dish.Enjoy your delicious and sweet salmon.